Even as their counterparts in Washington ramp up pressure on Roy Moore, Republicans in Alabama are staying loyal. WASHINGTON — Republicans in Washington may be abandoning Roy Moore by the droves. But in Alabama, the GOP has Moore's back and is threatening retribution against defectors. The chairwoman of the Alabama Republican Party warned she's ready to enforce strict rules on party purity in the state's Senate race, even if it means kicking GOP candidates off the ballot in future elections. "It would be a serious error for any current elected GOP official or candidate to publicly endorse another party's candidate, an independent, a third party or a write in candidate in a general election as well,” Alabama GOP Chairwoman Terry Lathan told the Alabama Political Reporter. "I have heard of no GOP elected official or candidate that is even considering this option." A write-in is one of the only ways Republican opponents could stop Moore at this point, since it's too late to change the ballots. Lathan did not respond to requests for comment but the threat is being taken seriously in Alabama, since party rules — as Lathan pointedly noted — can be severe. Alabama GOP bylaws give the party "the right to deny ballot access to a candidate for public office" to any elected official who "either publicly participated in the primary election of another political party or publicly supported a nominee of another political party." The provision applies for six years, meaning Alabama Republican officeholders who run against Moore or support a challenger could theoretically be barred from running again on the Republican ticket until 2023 — a political death sentence in deep-red Alabama. "As long as Roy Moore is our nominee, a Republican cannot wage a write-in campaign under Alabama Republican Party rules and be on the ballot as a Republican in the future," Rep. Mo Brooks, R-Ala., told reporters when asked if he was considering a run himself. But Alabama Republicans likely don’t need much arm-twisting anyway to stick with Moore through the December 12 election. Even as their counterparts in Washington ramp up pressure on the Senate candidate following recent allegations of sexual misconduct, few if any prominent Republicans inside Alabama have split with Moore, exposing a major rift between the state and national parties. Moore, who has denied all the allegations, was defiant Tuesday after Senate Majority Mitch McConnell called him "obviously not fit to be in the United States Senate." The Republican National Committee dropped out of a joint fundraising agreement with Moore late Tuesday, according to a document filed with the FEC. It also ended its field operations in the state, where it deployed 11 operatives, NBC News confirmed. That leaves Moore's campaign and the Alabama Republican Party alone in the fundraising arrangement. Some Alabama Republicans think the pressure from Washington will only help Moore energize his base, noting he beat McConnell’s favored candidate by 9 percentage points in the party primary by running against the GOP establishment. "The next move they'd try to make is to find a home in the metro Atlanta area and get out of the state, because they'd be dead politically here,” Reynolds said. Alabama Republicans, regardless of how they personally feel about Moore, are also keenly aware that they will have to appeal to the same voters who are currently sticking with him in their own primaries next year. "This is the political tightrope of the century," said Alabama GOP strategist David Ferguson. "How do these elected officials answer the allegations against Roy Moore, in a hyper-political environment, without isolating their Republican base and without disregarding the very serious charges that are on the table all seven months before another heated round of statewide primaries?" 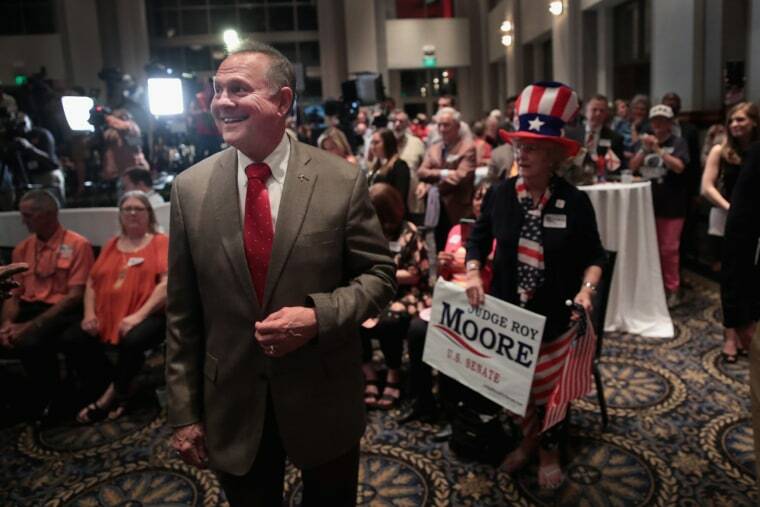 At an appearance Tuesday evening at the "God Save America Revival Conference" at a Baptist Church in Jackson, Moore portrayed himself as standing up for religious liberty against critics from the establishment GOP and Democrats. He only directly mentioned the allegations at one point in the around 30-minute speech. "What do you think I’m going to do? Why do you think they’re giving me this trouble? Why do you think I’m being harassed by media — and by people pushing forth allegations, in the last 28 days of this election?” Moore asked the congregation. "After 40-something years of fighting this battle, I'm now facing allegations — and that's all the press wants to talk about," he said. "But I want to talk about the issues. I want to talk about where this country’s going, and if we don’t come back to God, we’re not going anywhere." "They've done everything they could, and now they’re together, to try to keep me from going to Washington," he said. Also Tuesday, it was revealed that at least one person in Alabama received a robocall from someone claiming to be a reporter for the Washington Post seeking to pay money for claims against Moore — a fake call that was condemned by the newspaper. The call was first reported by CBS station WKRG of Mobile, who spoke to a pastor who got the call. "The Post has just learned that at least one person in Alabama has received a call from someone falsely claiming to be from The Washington Post. The call’s description of our reporting methods bears no relationship to reality,” Post Executive Editor Marty Baron said in a statement. "We are shocked and appalled that anyone would stoop to this level to discredit real journalism," Baron said. Alex Seitz-Wald and Alex Moe reported from Washington, D.C., Phil Helsel from Los Angeles, and Vaughn Hillyard from Alabama. Vaughn Hillyard and Alex Moe contributed.